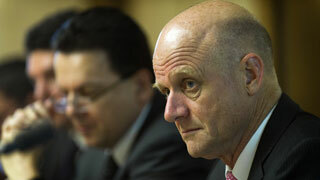 Australian Senator David Leyonhjelm has a simple message for the country's Classification Board. Last week, the Australian Classification Board refused to classify Outlast 2, effectively banning it from sale in the country. While it certainly wasn't the first game to get that treatment from the board - Saints Row 4, Hotline Miami 2 and State of Decay received similar treatment - this action got the attention of Senator David Leyonjhelm, a member of the Liberal Democratic Party in New South Wales. Speaking on the floor of the Senate earlier this week, Leyonjhelm pointed out that while 68 percent of Australians play games regularly, and the average age of those gamers is 33, the country's laws relating to those games are made by those who have no knowledge of the medium. He said, "For example, not many senators or senior public servants would know the difference between a ghoul and an alghoul, and so would find it hard to advance in the video game known as The Witcher." He also said that "politicians and public servants" are unable to access a number of popular game sites, including IGN and PC Gamer, because their network blocks the sites. Leyonjhelm said, "This is presumably because we might stumble across an image of something somebody disapproves of from a medium we don't understand." He contrasted this with other sites that remain accessible, including "Neo-Nazi forums like Stromfront, and video sites like LiveLeak, where you can watch videos of real people being killed." He also called into question the board's reasoning, saying, "All of this operates on the assumption that people who play video games are impressionable children who would play out anything they saw. Yet the internet is now awash with all manner of unpleasant images involving real people, not computer generated [characters], while violent crime around the world is in decline." "It makes wonder," Leyonjhelm said, "how is it that adults are not trusted to make choices about video games, and yet they are allowed to vote?" In concluding his statement, the senator contrasted Poland, whose Prime Minister gifted a copy of The Witcher 2 to then-US President Barack Obama, to Australia, where he says, "every signal we send to the gaming community...is of censorship, disapproval and discouragement." "Video games do not hurt anybody," Leyonhjelm said, "and the government Classification Board should leave gamers alone." It's not clear what, if any effect this statement might have on the Australian government's policy, but it's nice to see that someone down under is willing to speak out in defense of games. You can watch the senator's full remarks below.